Christmas is a magical time and the feeling of it is totally different in each city..Today i-Marbella brings you the glamorous window shops, bright lights and glossy decorations of the fashion capital of the world - Paris. 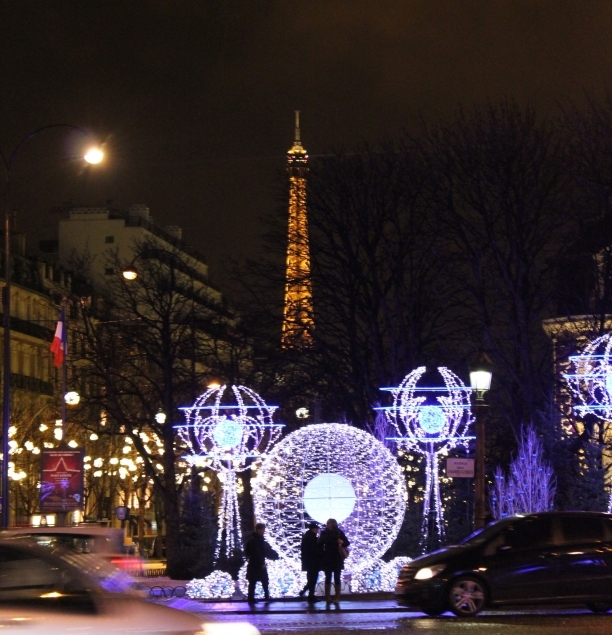 Paris, like all other cities at the moment, is decorated with beautiful christmas lights. And not just in one or two places, but all over the city and all sorts of decorations and christmas trees. The main street, Champs-Élysées has the most extravagant decorations, which this year are very modern and change colour - one day blue, next day red - that's what I call fashion lights! The avenue is full of people and cars, whether it's day or night. The first think I noticed in the morning, when I was going to have a croissant and a coffee, was the Louis Vuitton boutique - it's the biggest thing I've ever seen! Its full of Vuitton bags, shoes, glasses, clothes whatever you want you can purchase from there! Entering the shop, you'll be greeted by two doormen, who will open and close doors for you and the weirdest thing was that it was full of shoppers like a big market! Big queues at every cashier, even thought the cheapest tag you can find there is 300 euros! And this will only give you a keyring! If you're looking for a purse, get ready to spend 1200 at least! The best place to go window shopping, whether day or night, is on the streets of Montaigne or Crème de la crème Faubourg Saint-Honoré Its located in the old town and its full of boutiques, ending with Place Vendôme, that is next to the famous hotel Ritz. The hotel was also the last place to stay in Paris for Princess Diana. Close to the Faubourg Saint-Honoré street is also the famous shop of Christian Louboutin shoes. And this one also had a 30 metre queue at the door! The oldest and the most famous mall in Paris is located on Boulevard Haussmann and its called the Galeries Lafayette. Of course it was also covered with pretty christmas lightsand already the house itself is a sight to see! Paris department stores are famous for being worlds unto themselves. Galeries Lafayette department store dominate Boulevard Haussmann with real Belle Epoque grandeur, concentrating top designer collections for men and women, gourmet food shopping, home design, jewelry, and even hardware into a labyrinth of consumer delights. Besides the luxurious shops and boutiques, Paris is also full on countless cafeterias and restaurants, where you can spend time all day and night. The good thing is that there is something for each taste! Starting from designer places like Armani, Ralph, Cavalli to beautiful places for a 5-o-clock tea such as the Ritz Hotel, Hotel Plaza Athenee, Four Season aso. There are also lots of trendy place like Market, Avenu , Budhha Bar, Hotel Costes Bar and Lounge, and the hottest nightclubs at the moment would be the VIP Room ja L'Arc Paris. Walking in the magical streets of Paris will get anybody in Christmas mood for sure..
Paris is one of the best cities in the world...after Marbella! Annika Nice Trip, Feliz Navidad!